I finally got to drive Route 66. Not all of it, just a short stretch, but enough to feel the magic. Dubbed the ‘Mother Road – the road of flight’ by the fictional Joad family in Steinbeck’s The Grapes of Wrath, this narrow, two-lane road goes from Chicago to Los Angeles (2448 miles in all) and, for the most part, runs parallel with Interstate 40. Route 66 0pened on 11 November 1926 in Springfield, MO. Back in the 1930s, it was the path to freedom for many from Oklahoma who went west, dodging the clutches of the Dust Bowl. It has been immortalised by writers like Jack Kerouac. It has been a source of wonder and inspiration for comedians like Billy Connolly. But in the 1980s, it had outlived its usefulness and on 27 June 1985, it was decommissioned, no longer an official US highway. 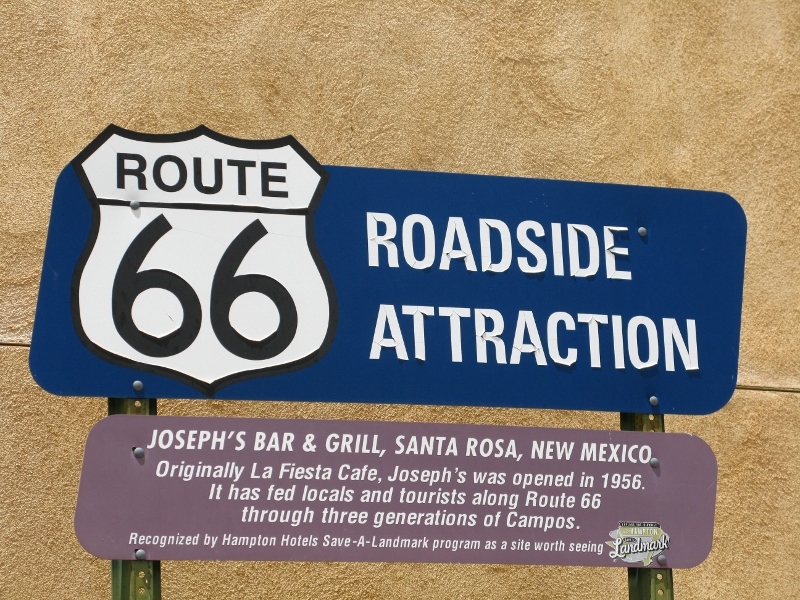 It hasn’t gone away, though, and while it might not be ploughed by snow ploughs during the winter or patrolled by Highway Patrol year ’round, the Mother Road is still very much alive and kicking – and as the t-shirts and fridge magnets declare, many still get their kicks on Route 66. Like much of the rest of my world (Ireland and Hungary), many small towns thrived from the traffic the route brought. But then, as infrastructure upped a notch or five and freeways and highways and motorways were built, the lifeblood of these small communities was choked at source. In the USA, it was Eisenhower, who in 1956, inspired by the German autobahn he had seen during World War II, began the move to make US highways more efficient. 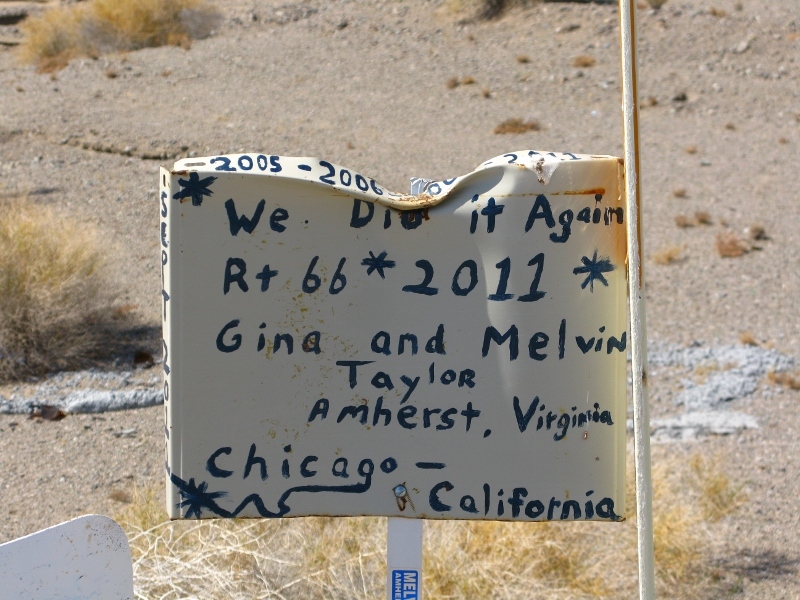 Route 66 was what might be called collateral damage. Now, instead of booming centres of commerce, Route 66 is dotted with tacky souvenir trading posts, fast-food joints, and petrol stations. 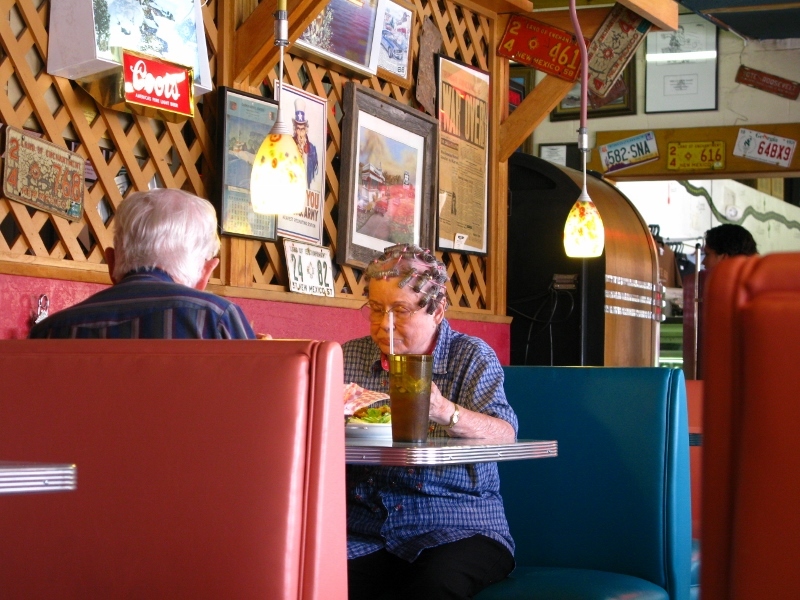 There is the occasional gem, though, like Joseph’s Bar and Grill in Santa Rosa, New Mexico. Here, in 1956, a WWII veteran by the name of José Campos, opened La Fiesta drive-in, which developed into a full-service restaurant within a couple of years. Handed down to the next generation of Campos in 1985, it blossomed under the banner ‘Joseph’s Bar & Grill’. Now home to a gift shop, the restaurant is what any tourist would expect of an American diner. It has struck the right note between tacky and nostalgic and the food is as comforting as diner cooking should be. It doesn’t stand on ceremony – come in your curlers! This couple, in their eighties, were making their way north to see their kids and were a tad concerned about the possibility of running into wildfires. But they’d resolved to go as far as they could go. Hats off to the tenacity of older Americans, whose ‘live it while you can’ attitude would put many a more delicate European to shame. 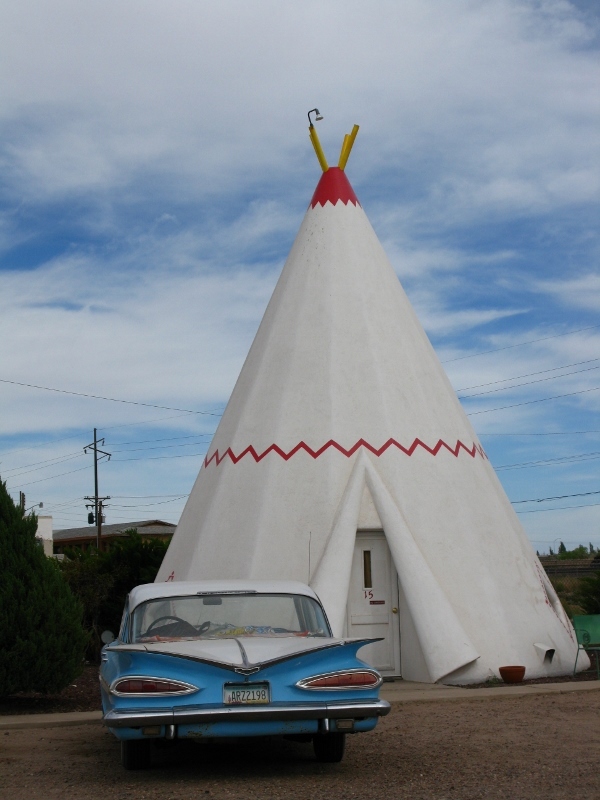 Route 66 may have been decommissioned but it still hasn’t lost its magic. Along this very same road hundreds of thousands of people have travelled to better lives. Today, motorbikes and RVs and clapped-out cars make the trip as their drivers search amidst a nostalgic haze for life as it used to be. There’s something so romantic about ‘doing Route 66’ – something I’ve had on my bucket list since I first read Jack Kerouac. And now that I’ve had a taste, the notion has cemented a place in my top 5 things to do before I die – preferably on a Harley. It’s a treasure of oddness and eccentricity. It’s the home of the Cadillac Ranch in Amarillo, TX, the Continental Divide between Brannigan and Parks, AZ, and the Wigwam motel in Holbrook, AZ. 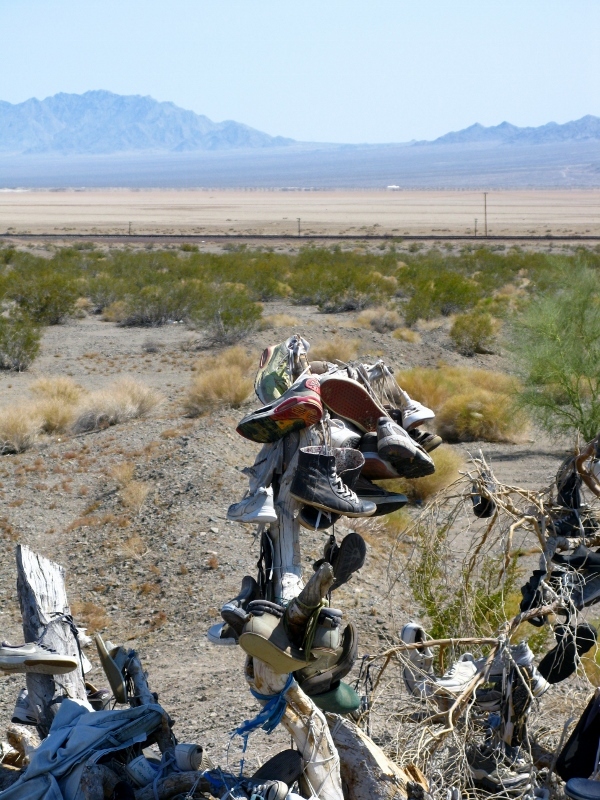 There’s also the Amboy Shoe Tree in California, the steady demise of which chronicles the demise of the route itself. Off to the side, American Indians trade their wares. The crafts of local artisans battle for space with Chinese imports. Billboards line the highway urging travellers not to miss the biggest and the best, each one promising something it can never hope to deliver. Yet the plight of towns like Amboy are a grave reminder of the price of progress. 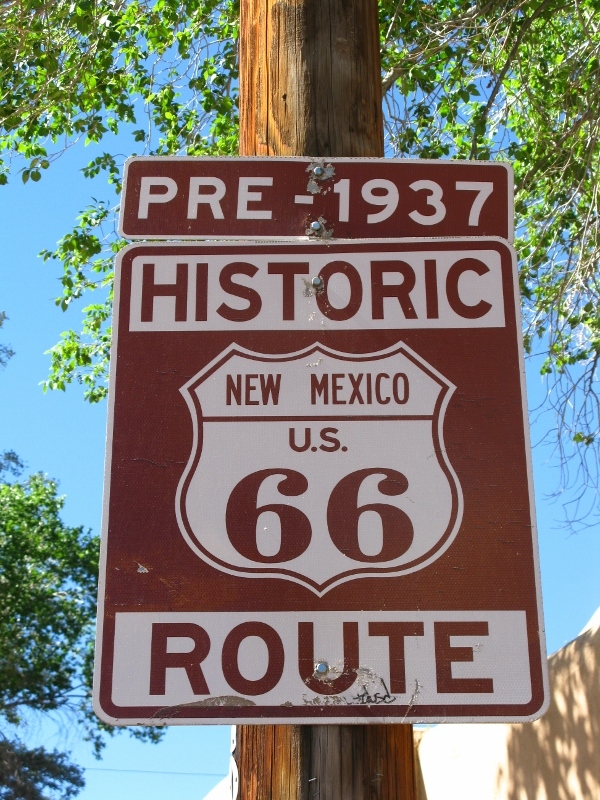 Despite efforts to protect America’s first paved highway, Route 66 now features on the Top 100 Most Endangered Sites to Watch – courtesy of the World Monuments Fund. With just 85% of the road still drivable, perhaps I’d better up the ante a little and promote this trip to top of my list. Man’s inhumanity to man makes countless thousands mourn – ah, yes, Robert Burns, you certainly got that right. The countless thousands I have in mind are the Cherokee Indians and other Native Americans who were forcefully removed from their homes in the 1830s. Having enjoyed life on vast expanses of land in Georgia, Tennessee, Alabama, North Carolina, and Florida, their normalcy was soon to be disrupted as white settlers laid claim to their lands to grow cotton. 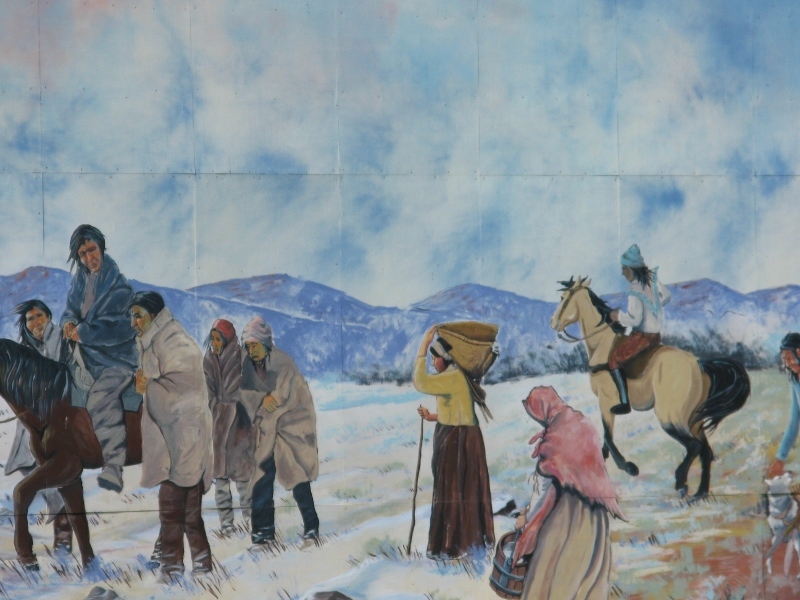 Forced by the federal government to walk hundreds of miles to a part of the country designated as Indian territory, they set out on a journey that the Cherokees called the Trail of Tears to a state now known as Oklahoma. 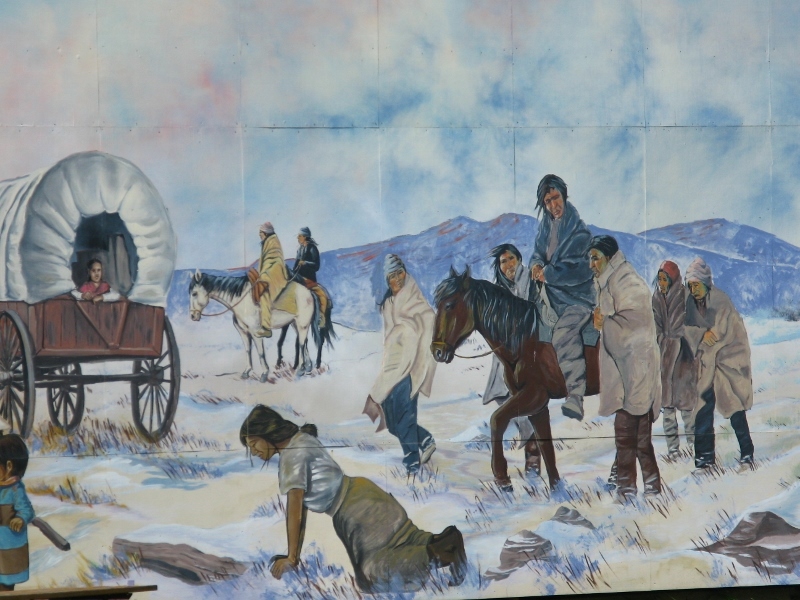 Over 4000 of 15000 Cherokees who set out on this epic journey in 1838/1839 died in transit. The name Oklahoma is actually an Indian word – it comes from the Choctaw words oklah homma meaning ‘red people’. While some Indian tribes agreed to be ‘removed’ to the state and signed treaties surrendering their lands, more than 25 tribes did not agree and were forcibly relocated. Today, there are 34 Indian tribes registered in the State. Casinos are plentiful and trading posts scattered along the I40 interstate sell Native American crafts supplemented by the now ubiquitous offerings from Nepal and Bali. And, in the interests of transparency, anything not made by Native American crafters is clearly marked as such. It’s interesting, too, to see globalisation at work and to see some new gems in the Native American jewelry market with Australian and Russian gems now being set in Indian silver. Nothing like cross-pollination in the name of commerce. Oklahoma is a funny state. American humorist Will Rogers reckoned that when ‘the Oakies left Oklahoma and moved to California, it raised the IQ of both states’ (and he should know – he was born in Oklahoma). I can’t comment on the relative intelligence of either state, but in an odd turn of events I had to wonder about Oklahoma’s penchant for understatement, which would appear to me to go against the national grain. I was expecting to see a monument worthy of the embellishment ‘national’ – and was I disappointed. But shame on me for expecting so much. I didn’t learn anything I didn’t already know about Maria Manriquez deLara, she who first brought the image of the infant from Spain to what’s now the Czech Republic. But I did learn about Fr Stanley Rother, a priest from Oklahoma city who was murdered while serving as a missionary in Santiago Attilan in 1981. Apparently, there is a petition registered with the Vatican to consider Fr Rother ‘fit for veneration’. 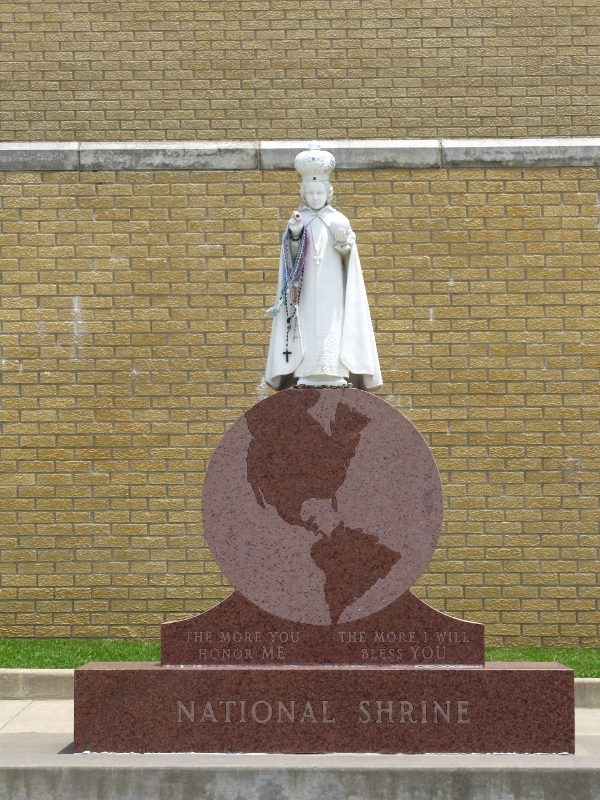 According to the brochure, if canonized, he’d be the ‘first slain priest from Oklahoma to become a saint’. It begs the question: how many more priests from Oklahoma have been slain in the line of duty? As I said, Oklahoma is a peculiar state but one that’s the birthplace of my heartthrob, James Garner. Country singers Garth Brookes and Vince Gill are also natives, as was Ralph Ellison, and actors Brad Pitt and Tony Randall. Those luminaries aside though, the state has some pretty weird laws. For instance, in Bartlesville, if your dog is run over by a car, you have to pay any costs associated with its disposal. And you can’t own more than two adult cats or dogs. And in Oklahoma City, it’s illegal to own a stink bomb. The mind boggles.